Michigan Crossroads Council has some of the finest properties in the United States. Whether you are part of a religious, school, or Scouting group, we are pleased you are considering us for your next conference, camp out or weekend activity. Reservations are now open for 2018. Click “Make Your Reservation Now” below to register. If you would like to learn more about our camp properties, please look below. Cole Canoe Base offers both year-round and summer camp opportunities for groups seeking a fantastic place to participate in outdoor activities. All campsites and White Pines cabin are available throughout the year outside of the summer camping season to any interested units. Scouts can practice their shooting sports skills in camp, go hiking on our many miles of trails, and participate in other unit led scouting activities. Your group holding a weekend campout here at Cole Canoe Base will enable your scouts to have the opportunity to complete requirements towards advancing in rank or completing merit badges. Since 1950, D-bar-A-Scout Ranch has been providing quality scouting experiences for Scouts, Schools, and Churches from Southeast Michigan and around the Midwest. D-bar-A is located about an hour North of Detroit, MI. The ranch consists of over 1,700 acres of wilderness, 3 lakes, a herd of horses, Long Horn Steer, and other livestock, 28 heated cabins, and 11 tent sites. Program facilities include a 32 foot climbing tower, two shooting sports areas for Cub Scout and Boy Scout needs, several Nature Centers, Bouldering Wall, and 11 miles of hiking trails. Gerber Scout Camp first opened in 1951 and is located in the Manistee Forest near Twin Lake Michigan. 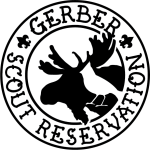 Gerber Scout Reservation operates Boy Scout Summer Camp and Webelos & Cub Scout Summer Camp. Gerber offers many different year-round programs and are currently developing even more. We rent a large variety of our building out for your scouting events. More information are detailed below in the Year Round Programs and Services. If their is a program you would like to see offered reach out to the Reservation Director; we are always welcome to new ideas. Camp Munhacke, has 120 acres on the shores of Bruin Lake, just 15 minutes north of Chelsea. While focused on Cub Scouts during the summer, the camp provides many great amenities to Scout Troops, Venture Crews, and outside groups during the rest of the year. At Rota-Kiwan Scout Reservation you will find over 199 acres of beautiful terrain dotted with oak, pine, maple, cedar and poplar. Rota-Kiwan Scout Reservation has frontage on Bass Lake and Scouter’s Pond. Fish and wildlife are plentiful. The camp is rich in program, a perfect setting for your Cub Scouts to experience real Scouting adventure! Rota-Kiwan focuses on the Cub Scout camping experience with theme based campsites complete with nearby modern shower houses and flush toilets. Major activity areas include aquatics, shooting sports (rifle, archery, and shotgun), ecology conservation (nature), outdoor living skills (Scoutcraft), a fine arts area (photography and cinematography) and many other advancement and program opportunities. Located in the central part of Michigan’s Lower Peninsula, Camp Rotary has one of our country’s clearest spring-fed lakes, scenic rolling hills and fragrant pine trees, making it one of the most beautiful camps in the country. With over 1,100 acres and abundant natural resources, Camp Rotary is able to offer a wide variety of programs and welcomes Scout Troops, School, Church, Civic, Fraternal organizations and corporate groups on a year-round basis. Camp Rotary offers a wide variety of innovative programs each summer and welcomes Scout Troops from both in and out-of-state each summer. Camp Rotary boasts perhaps the most beautiful waterfront of any Scout camp and has specialty programs for older Scouts and first year campers alike. Always one of the most popular areas in camp is the dining hall where tasty, well-balanced meals are served family style. Premiere Shooting Sports Ranges, COPE, Climbing and Rappelling, our new high-tech M.A.D.E. area, a family carnival on Friday night, and modern shower houses make Camp Rotary an ideal camp for any Unit! Silver Trails is a 269.6 acre camp near Jeddo, Michigan, on the St. Clair-Sanilac County line. It is 28 miles North West of Port Huron, 78 miles North East of Detroit, 68 miles East of Flint and 88 Miles South East of the Tri-Cities; just a short 20 minute drive from a major shopping area. Silver Creek winds through the Scout camp, emptying into the Black River on the east end of camp. There are five cabins, three Adirondacks (3-sided shelters), and fourteen campsites. The camp’s Dining and Meeting Hall, known as the Rotary Lodge, was a gift from area Rotary Clubs and was completed in 1948. The camp was dedicated on November 1st 1945. Over the years, numerous other buildings and facilities were added to the camp. These include a chapel, health lodge, Order of the Arrow Trading Post, Nature Center, and most recently, a new Training and Activities Building. dest Scout camps in the country, it is home to the Michigan Crossroads Council STEM Exploration Program. ( STEM = Science, Technology, Engineering, Math). Camp Teetonkah also offers weekend camping for Scout units. Campsites offer on site water, and are a short walk to modern indoor restrooms. The dining hall pavilion is also available to rent for your unit to use for meetings, picnics, or just some protection from the elements. Electricity and lights make using it at night very convenient. Want to combine STEM and weekend camping? Let us know and we’ll plan a program segment for your Saturday, from 1 to 4 hours. With adventure, fun and discovery at every turn, Scouting makes the most of right now. For the latest news, updates and event information. © 2018 Michigan Crossroads Council - All Rights Reserved.